A first kiss is always memorable. It always intimates something more, of a moment of passion that has yet to be realized. But there is always a hint and a spark the first moment that lovers meet. The tints and shades of the vibrant images in The Quiet Man also promise deep passion, and the ethereal blues and fleshly reds of Mary Kate Danaher’s shepherdess ensemble evoke images of Madonnas reposing in cathedrals and churches, but Mary Kate evokes the promise of the flesh with the dedication of fealty to her heritage, her church, and her own convictions. When Sean Thornton is stricken by the vision of Mary Kate in the meadow tending to the sheep, her gaze promises that her “Walls of Jericho” eventually will crumble in dedication and in response equal to the flood of Sean Thornton’s emotions. Sean is searching in the dark, confused and unsure of his feelings. He knows something has changed in the cottage. He realizes something is different. The undulating rhythm of the wind ignites passion like the fire burning in the center of the frame at the beginning of the scene, like the fire burning in the hearts of the lovers. They both recognize the passion. It initiates, approaches, retreats, and finally resolves into the physical manifestation of Mary Kate’s slap, revealing how she still struggles with the strength of her desires for Sean Thornton. In The Quiet Man, the first kiss between Mary Kate Danaher and Sean Thornton, does just that. It reveals a tempestuousness, a desire, and an incomparable yet incomplete passion, and viewers recognize that unrequited passion, either from their own lives, or in the lives of others. 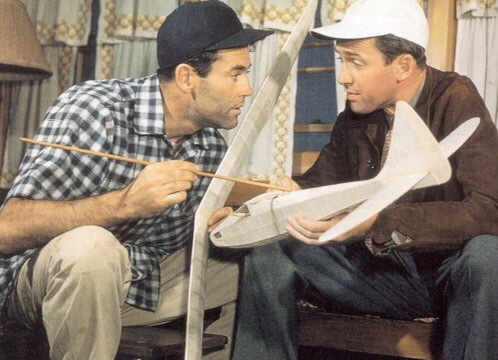 The yearning and desire from the first kiss in The Quiet Man between Mary Kate and Sean reveals expectation, but once the initial kiss is rebuffed by Mary Kate’s slap, viewers are strapped in for the desperate buggy ride to the final moment of The Quiet Man‘s fully-realized passion later in the film. In the cemetery, Mary Kate and Sean both reveal they don’t want to wait for the “walking out together” or the “thrashing parties.” Their first embrace, however, elicits a bolt of lightening and a clap of thunder, and Mary Kate immediately makes the sign of the cross over her heart, revealing her fear that her love for a man has superseded the desires of her loyalty to her God and her church. She seeks a divine protection from the unbridled passion in her soul. Mary Kate then looks at Sean with a fear in her eyes, and retreats to the safety of the arch of a long-disintegrated church or chapel, bringing Sean into her imagined comfort zone. Sean follows her, and they release the desire they have felt since Sean first saw the vision of the shepherdess in the verdant meadow. Mary Kate doesn’t retreat from Sean’s attentions anymore. Surrounded by a storm and weathering the drops of rain anointing their love, they commit to each other’s desires and passions under the arch that represents an accepting embrace of their fleshly plea for each other. In light of the Pope’s visit to this hemisphere this week, it is fitting that such a film be discussed on such a historic day and in conjunction with St. Valentine’s Day. The struggles allowed to voice themselves in John Ford’s The Quiet Man reveal how closely, in some respects, the film adheres to Catholic precepts of proper behavior in the 1950s. Mary Kate Danaher exemplifies chastity before marriage, acquiescing to her religious beliefs, but the worldly Sean Thornton brings all the disregard of tradition expected of a worldly-wise pugilist. 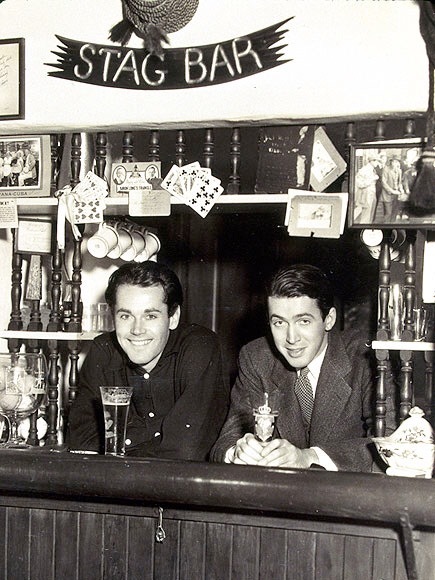 His resolve to win the heart of the woman he loves forces him to reevaluate his attitude toward local Irish traditions, Catholic religious beliefs, and the village that raises his inner child, as well as the woman who ignites his soul. Do real life experiences ever approach the passion in this film? They obviously do, or at least viewers of this film hope they do. To find such a passion, experience it, and accept it is what makes our existence thrive and resonate with our own desires. Here’s hoping all visitors to the Kissathon have such a kiss in your future! 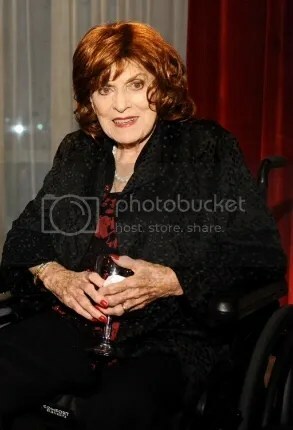 I would be remiss in my duties to fans of Miss O’Hara if I did not reiterate Miss O’Hara’s urging to audiences at the TCM Film Festival in 2014 that her religious beliefs played a very important part in her life and the decisions she made during her introduction to How Green Was My Valley with Robert Osborne. 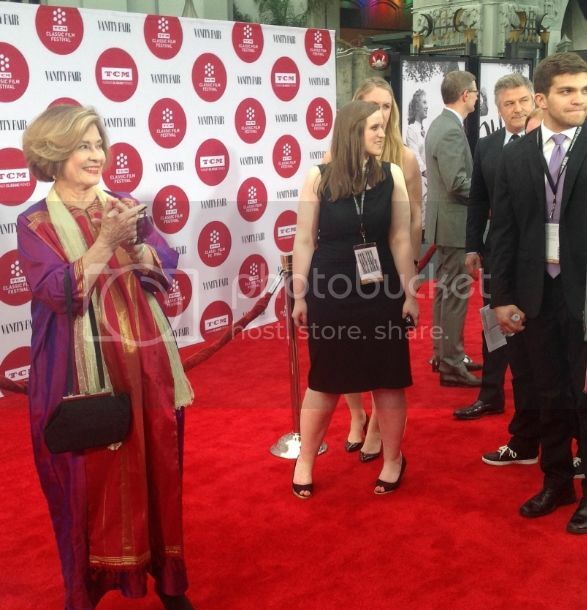 Top Red Carpet revelers at the Turner Classic Film Festival include an international group of pass holders and seasoned celebrities accustomed to the flashes and clicks of Nikons and iPhones on Thursday, April 10, at the Gala Premiere restoration of 1955’s “Oklahoma!” introduced by TCM Host Robert Osborne and Oscar-winning actress Shirley Jones at the TCL Chinese Theatre. 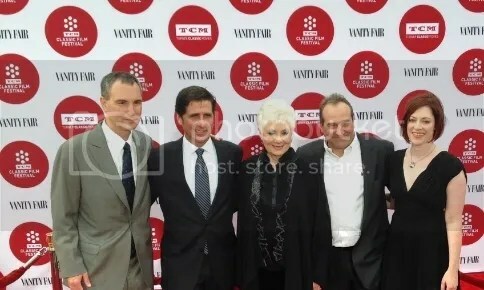 Special TCM Film Festival 2014 guest celebrities Shirley Jones, Maureen O’Hara, Margaret O’Brien, Kim Novak, Tippi Hedren, Bo Hopkins, Merrie Spaeth, Candy Clark, George Chakiris, Diane Baker, Richard Sherman, Leonard Maltin, Ben Mankiewicz, and Robert Osborne all paraded down the aisle at the popular event. Other stars attending the festival included Richard Dreyfuss and Alan Arkin. 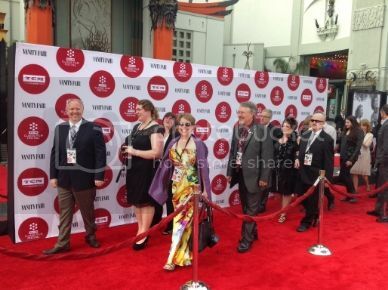 Fancy fans and glitzy celebs posed, pitched, and paired for photo ops from seasoned media professionals and admiring patrons as they walked the gauntlet of onlookers and dedicated classic film lovers on Hollywood Boulevard. 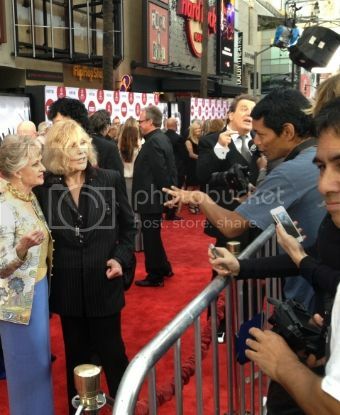 Actress Tippi Hedren, “The Birds” and “Marnie,” and actress Kim Novak, “Vertigo” and “Bell, Book, and Candle,” host a media photo op frenzy as fans and photographers snap away as the gals do the red carpet rumba at the TCL Chinese Theatre prior to Shirley Jones’ introduction to 1955’s “Oklahoma!” Both ladies were patient, gracious, and appreciative of all the attention they received Thursday, April 10, at the TCMFF 2014. 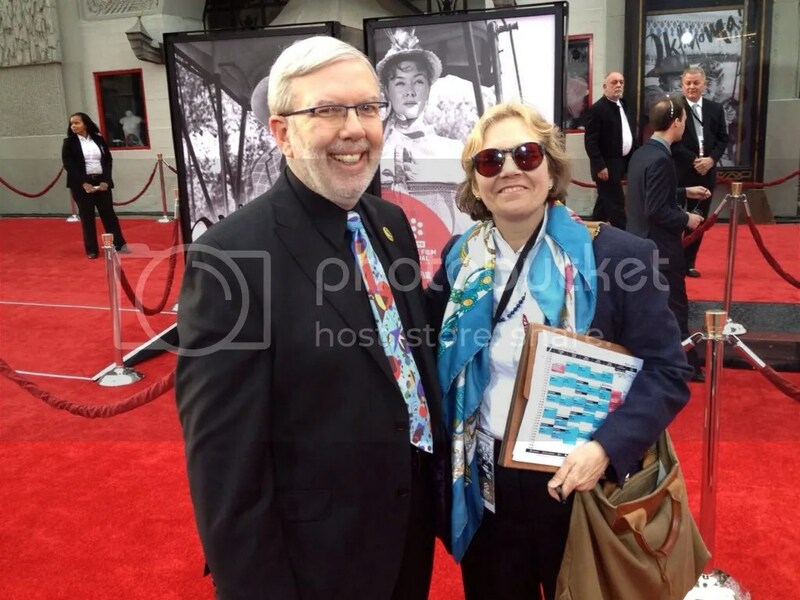 Actress Margaret O’Brien attended the Turner Classic Film Festival 2014 to introduce “Meet Me in St. Louis” on Friday, April 11, and memorialize actor friend Mickey Rooney prior to a screening of “National Velvet” on Sunday. 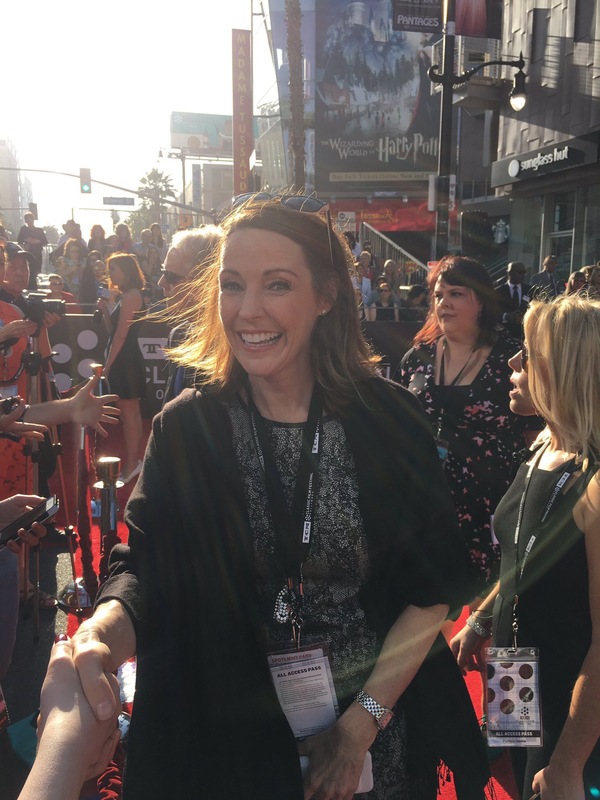 O’Brien visited with fans, signed autographs, and posed for photos with international fans and thrilled audiences during her multiple appearances. 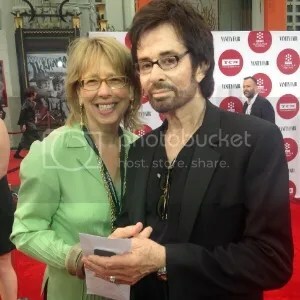 Writer Debra Levine and Oscar-winner George Chakiris of “West Side Story” pose for journalists. 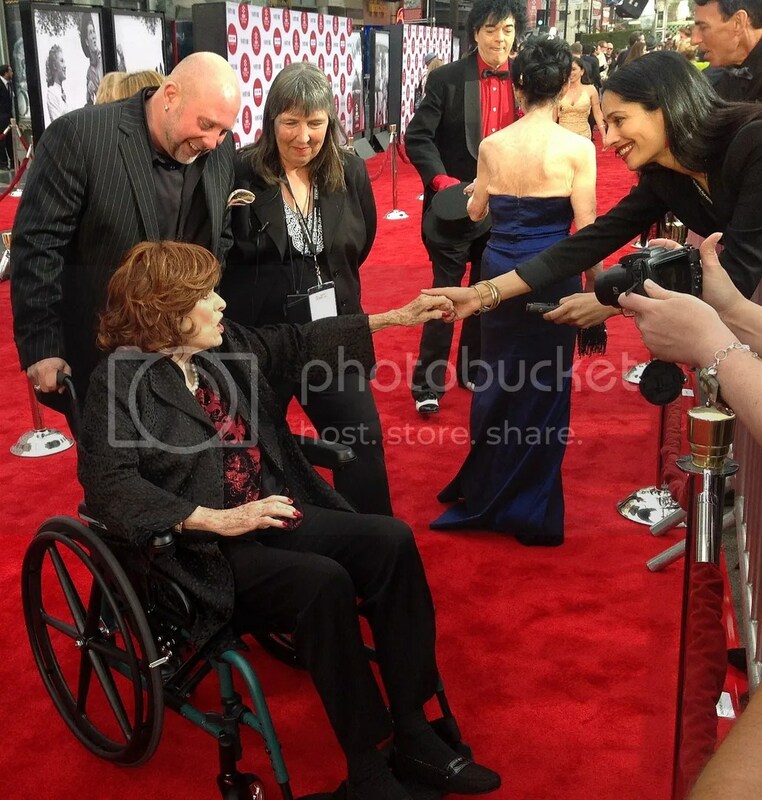 Levine hopes “everyone will visit” her Arts Meme blog as Chakiris graces her with a warm hug. Chakiris is also a jewelry designer and lectures on classic Hollywood. “I thought things like this didn’t happen to people who lived in Philadelphia and went to Quaker school,” said Spaeth, 65. 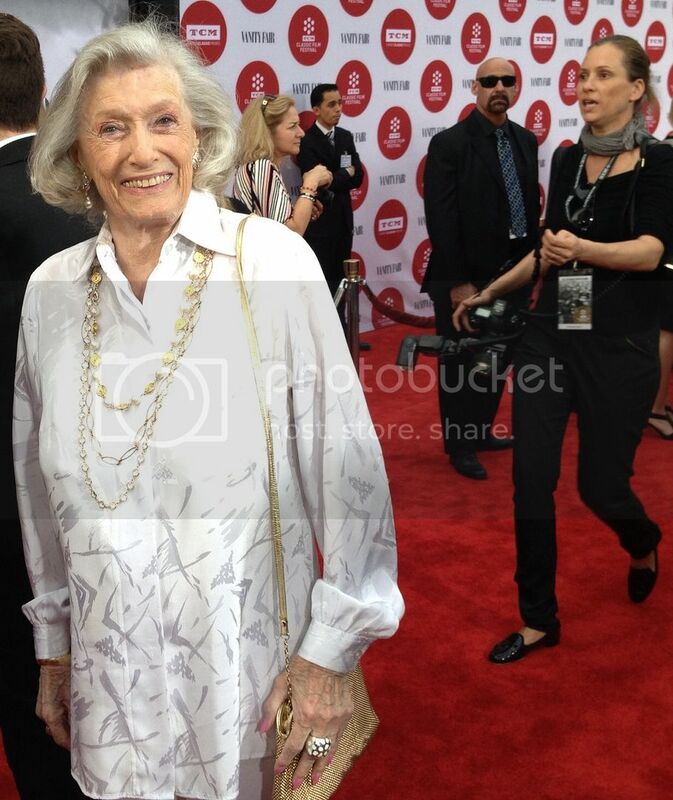 Spaeth was happy to be a movie star again if only for one day, and enjoyed her four days of fun at the festival. Spaeth is CEO of Spaeth Communications. 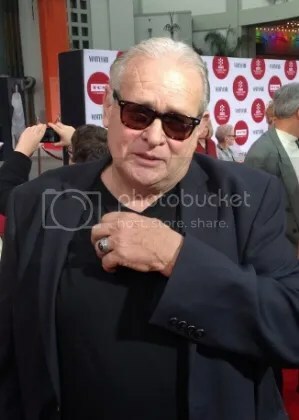 TCM Host Ben Mankiewicz emceed the special TCM/USPS commemorative stamp ceremony honoring former SAG/AFTRA president and actor Charlton Heston as well as poolside screenings and interviews with fans and celebrities at the popular festival. 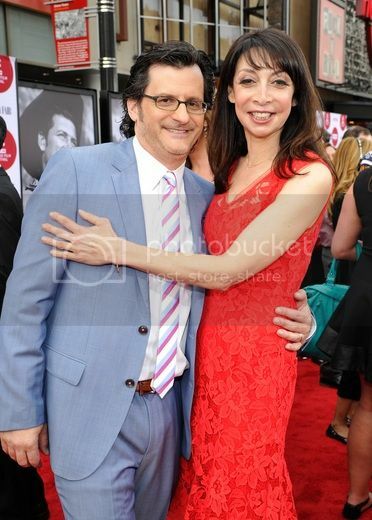 Actress, producer and director Illeana Douglas introduced Jerry Lewis at a screening of “The Nutty Professor” and interviewed Oscar-winning actor Richard Dreyfuss for fans in Club TCM. The granddaughter of classic film actor Melvyn Douglas, Illeana has a popular web series, and acts, directs, produces, and writes for the film and television industries. Festival fans file in for film screening of 1955’s “Oklahoma!” as they greet media and gallery members. 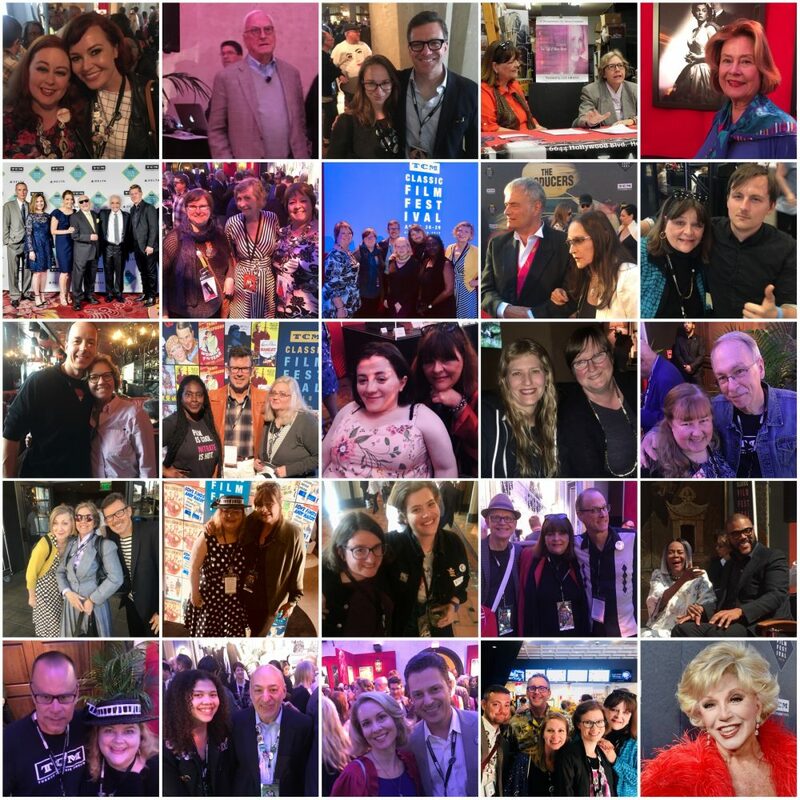 Pass holders came from Canada, the continental U.S, and several European countries to enjoy the festivities at the TCMFF 2014. 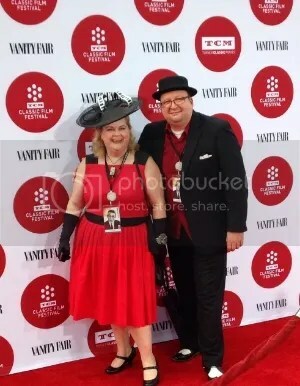 Flying in from Dallas, Texas, for the TCMFF 2014 fun, Dallas public relations executive Kelly Kitchens Wickersham and her husband Mark Wickersham enjoy attending screenings and panels. 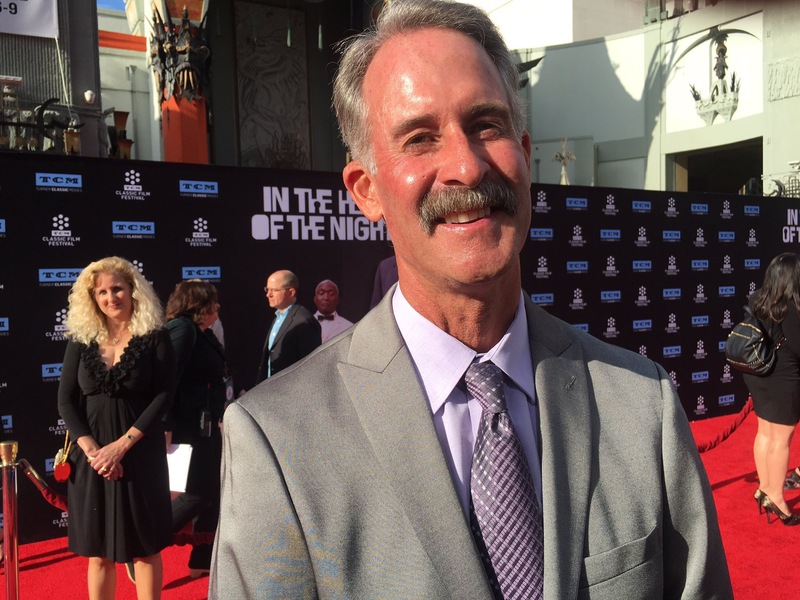 Wickersham administrates one of the most popular Facebook pages for TCM Film Festival fans. Choreographer Miriam Nelson was a doll AND she was all dolled up! 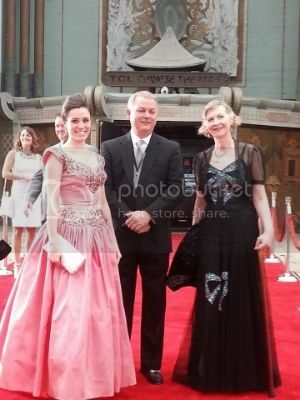 TCM Ultimate Fan Video Contest winner Tiffany Vasquez from New York donned a lovely flamenco-inspired vintage gown. 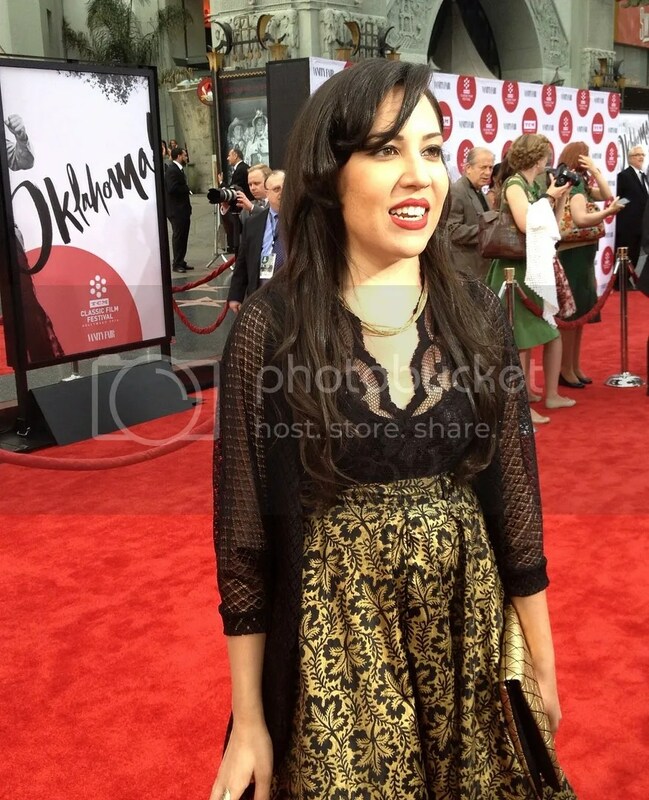 Another fabulous gal donning vintage togs was Texan Theresa Madere, a wedding planner from Burnet, Texas. 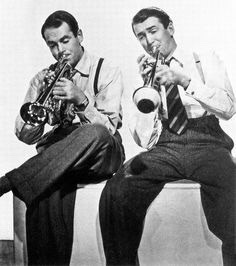 Her perky manner and her interested in classic films inspire her to blog as Butterscotch Greer on the TCM Message Boards Festivals Forum. 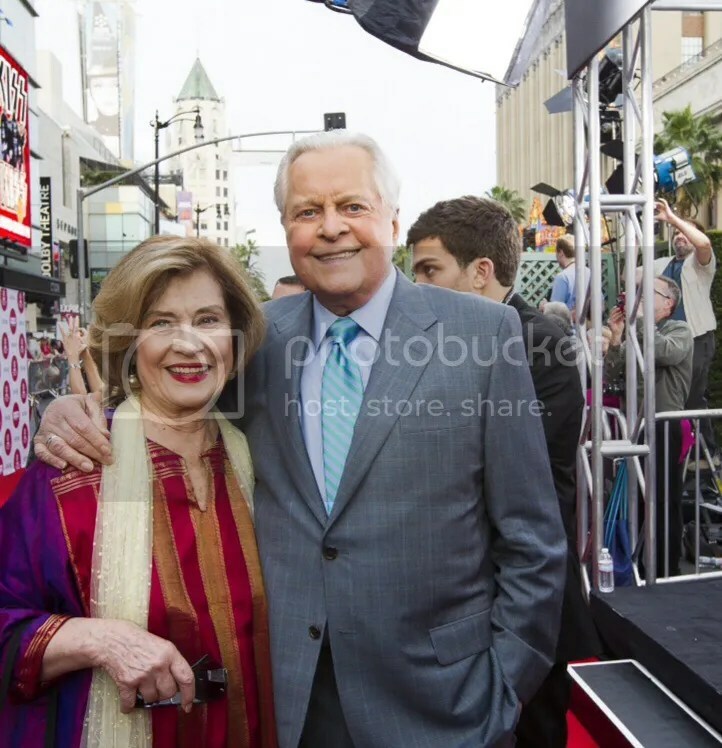 Popular TCM Host Robert Osborne and actress pal Diane Baker on the Red Carpet at the Turner Classic Film Festival appear to cheers from the crowd. 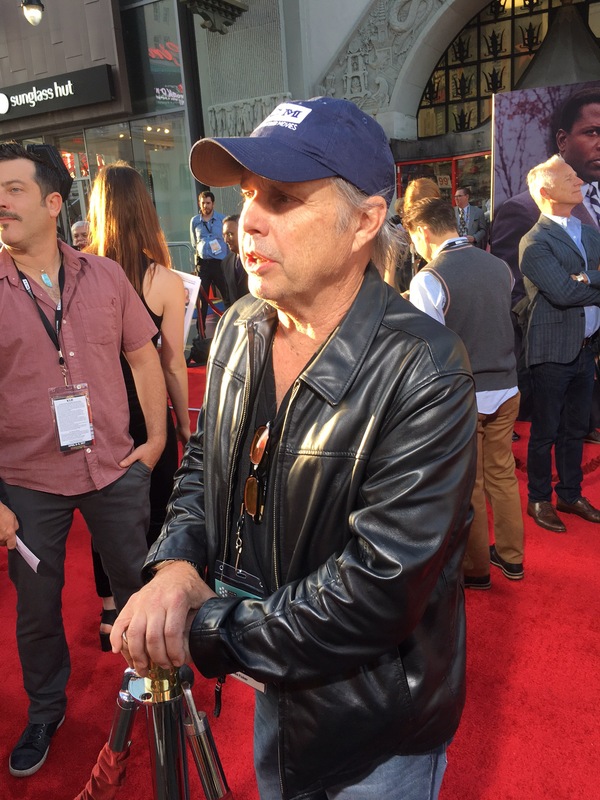 Baker is Director of Film and Television at San Francisco’s Academy of Art. Film critic and historian Leonard Maltin and TCM Senior Researcher Alexa Foreman smile for the cameras on Thursday evening before the screening of “Oklahoma!” Maltin hosted several panels and interviewed guests in Club TCM, and was always ready to sign autographs and to visit with fans of his books and articles. 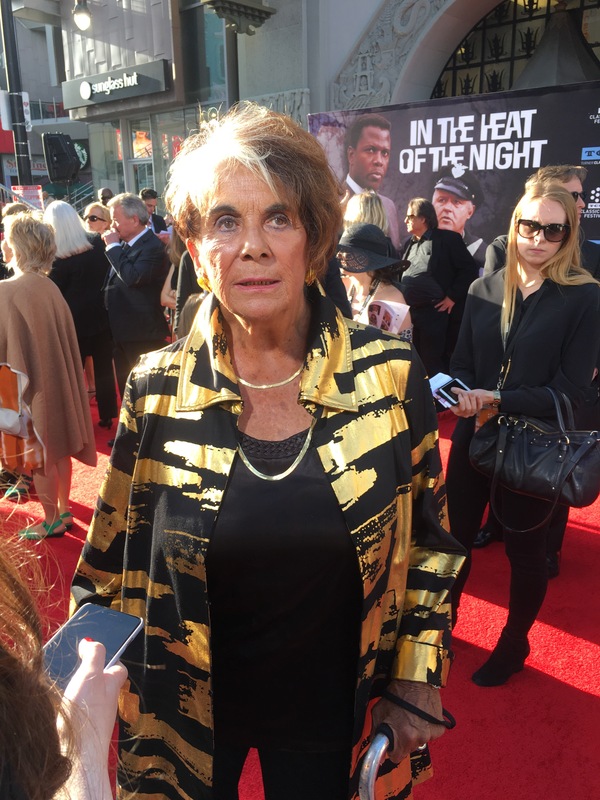 Foreman has conducted hundreds of interviews for the Turner Archives and is known as “The Keeper of the Flame” for classic film history at TCM because of her attention to accuracy and detail. 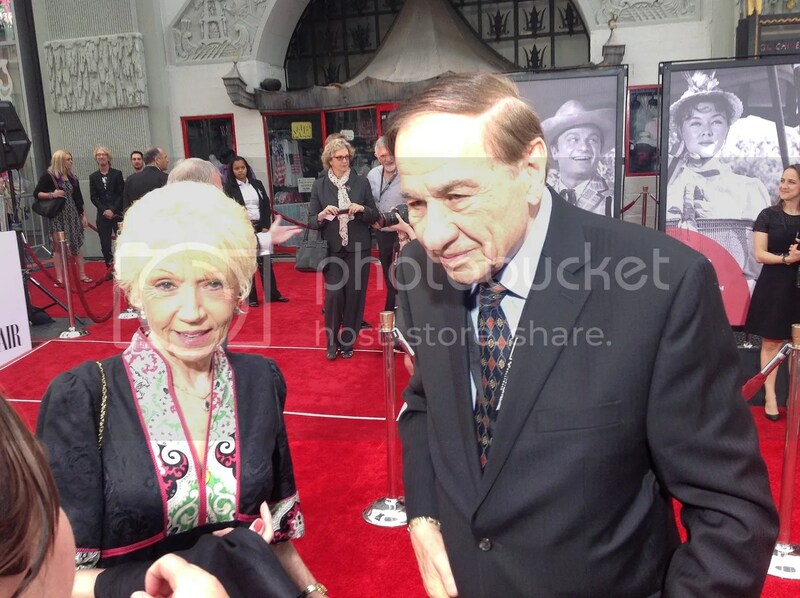 Composer Richard Sherman (“Mary Poppins,” “The Jungle Book,” Winnie The Pooh”) and his lovely wife Elizabeth stopped and chatted for several moments and revealed how happy they were to be part of the festival events. 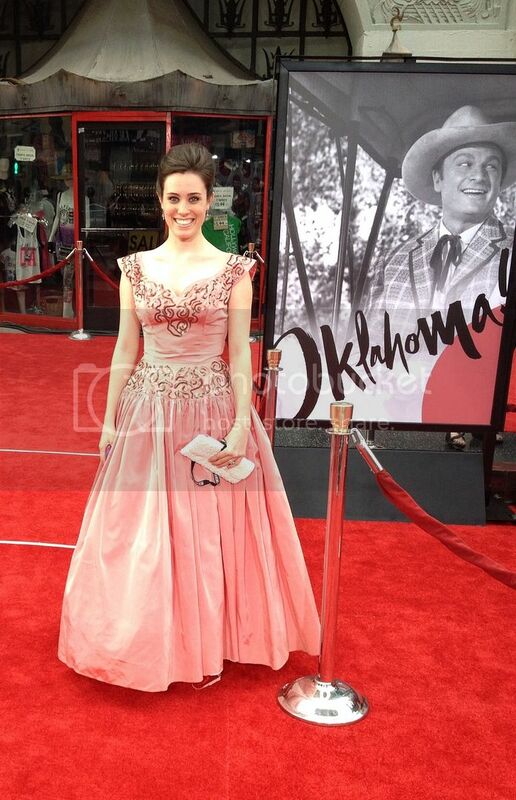 Actress Maureen O’Hara elicited the most excitement, awe, comments, and applause when she appeared on the Red Carpet prior to the screening of “Oklahoma!” at the Turner Classic Film Festival Gala Premiere Restoration Thursday evening, April 10, at the TCL Chinese Theatre. 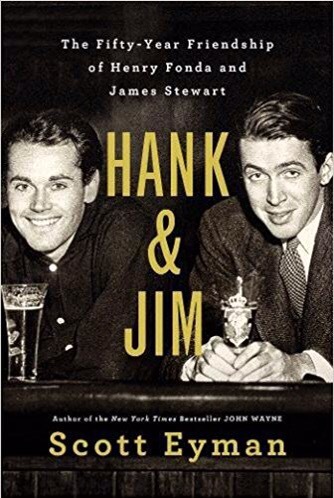 O’Hara was the most popular star attending the premiere and the Vanity Fair party after the screening, and introduced John Ford’s “How Green Was My Valley,” filmed in 1941, and participated in several interviews with TCM Host Robert Osborne. 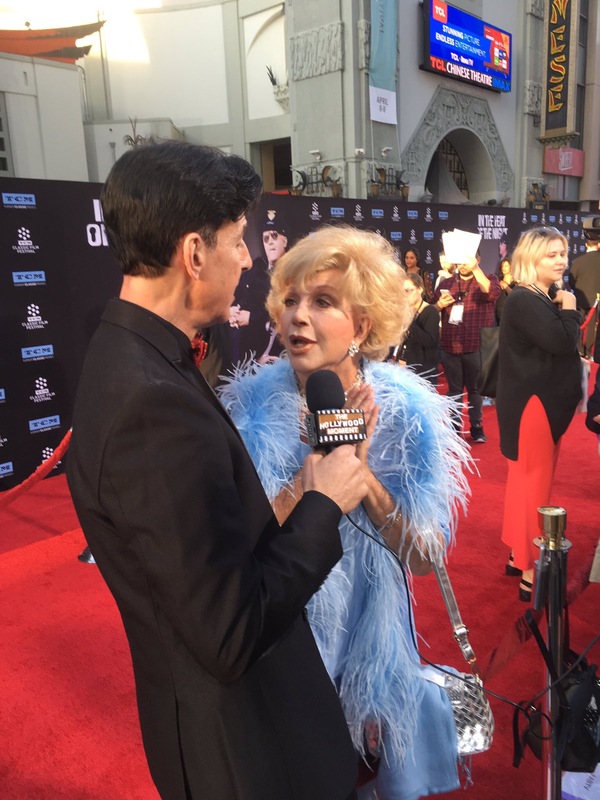 A few moments after this photograph was taken, O’Hara’s grandson, Connor Fitzsimons helped her move down the red carpet to my media station, and she reached out to grasp my hand. There was such love and admiration in her voice and her manner, and I knew how much she enjoyed being a part of the festival events. She told me “Thank you” twice, and as she was about to grasp my hand for her very firm handshake she had given to other media representatives along the corridor, someone called out to her grandson to move along, and she was whisked away. 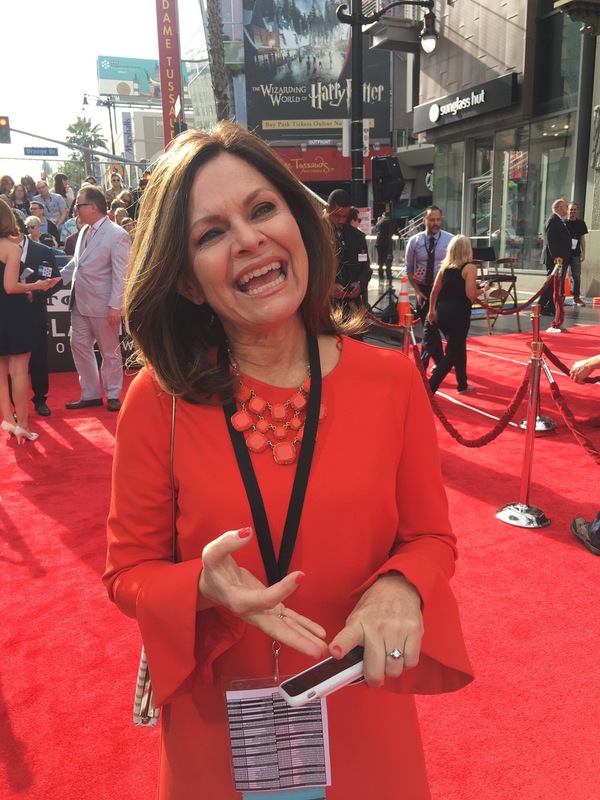 But for a few shining moments, she looked right into my eyes and showered me with attention, and she made me feel like the luckiest gal on the red carpet. Of all the celebrities at the April festival, she was the one that garned the most “oohs” and “ahhs” from passholders and other celebrities wherever she went. Her spirit and her determined air was a great inspiration to me and everyone else she me. Her events at the festival were the most popular for any individual celebrity, and all were blessed with the indomitable spirit of a great Irish lass. 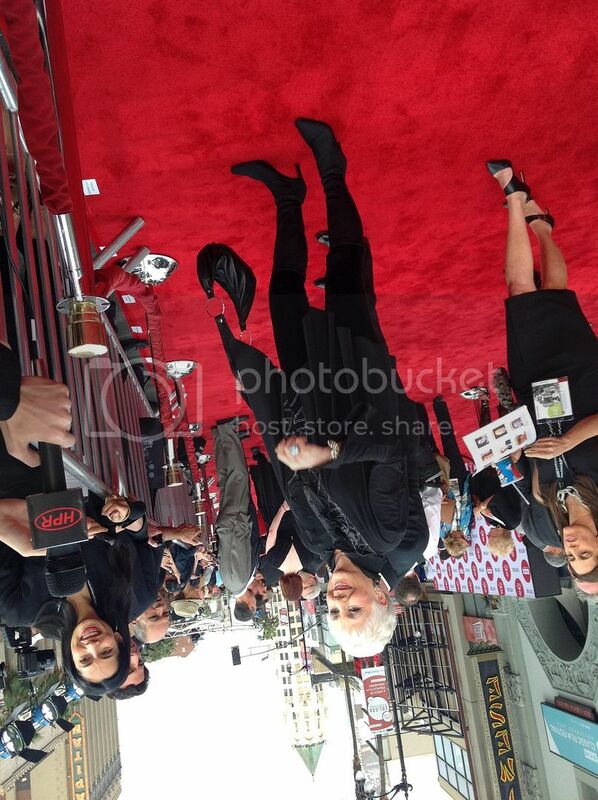 The excitement of photographing and interviewing celebrities is part of the allure of working a red carpet event. What surprised me most is that many of the credentialed media from established news outlets didn’t know who most of the celebrities were, and I found that one of my responsibilities at the event was to answer questions and explain who the celelbrities were, what their accomplishments entailed, and why they were at the festival. I am glad I was there!